Blood Oath is the first limited edition whiskey brand from liquor giant Luxco, headquartered out of St. Louis MO, and made famous by bourbon brands like Ezra Brooks and Rebel Yell. Pact No. 1, was just released (Spring 2015) and is a blend of three bourbons, ranging from six to twelve years old. For all my non science readers, Blood Oath's proof matches that of the normal human body temperature. 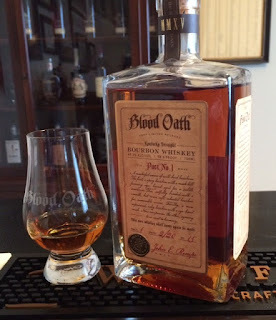 I was grateful to be sent this bottle as Blood Oath bourbons will be released annually and in very limited quantities. Nose: Heavy caramel with vanilla cream lead the way for a fairly sweet aroma. Sweet spice, apricot, and oak are present along with a slight varnish. Taste: On the tip of the tongue there is a wheat sweetness that is quickly overturned by a deep peppery spice. Cream soda, caramel candies, and honey blend lightly on the mid palate. There are nice herbal and mint notes present. Finally, the 12 portion of the blend year shows itself with a heavy dose of tobacco. Finish: Smooth and medium in length. The wheat sweetness and rye spice return along with a touch of oak. Conclusion: Blood Oath Pact No. 1 is a very unique bottle; the four grains (corn, wheat, rye, barley) really show themselves in this bourbon. It's a nice pour with a unique complexity- the awesome branding doesn't hurt either- but at an MSRP of $89.99 a bottle, it's not a purchase that I can recommend. That being said, I am looking forward to Pact No. 2, coming in 2016 and consisting of an entirely new bourbon blend. Woodford Reserve Double Oaked begins its aging process just like the Woodford Reserve Distiller's Select bourbon that we have all come to know and love. However, after the standard 7-8 years, this is then re-barreled in a second, deeply toasted oak barrel. This "double oak" process produces a whiskey with unique and dessert like character. Nose: Extremely sweet with notes of chocolate, honey, vanilla, and deep oak. While slightly diminished, I also noticed some coffee bean and cherry soda. It's very nice, and I wish it was a cologne. Taste: The palate is savory, creamy, and soft. Chocolate pie, sweet corn, nutmeg, maple syrup, and honey. Hints of cherries, spiced apples, almonds, and toasted oak combine for a well balanced and uniquely sweet bourbon. Honestly, it tastes like dessert, and I don't share my dessert. Finish: Medium in length; fairly dry with lingering notes of marzipan, coffee ice cream and toasted oak. Conclusion: As I really enjoy Distiller's Select, this Double Oaked bourbon did not disappoint. Try to pour yourself a glass and let it sit under your nose for 5 minutes- it's a daunting task only men with an iron-will can accomplish. The price tag is a bit heavier ($55) than the Distiller's Select, but the over-toasting of the second barrel produces a sweet, savory and intense bourbon full of flavor which is certainly worth a try.